Broadening its ever-growing global presence, Avasant has announced the launch of its Trinidad and Tobago operations to support its Latin American and Caribbean (LAC) practice. The launch was held on 15th May 2018 as part of Avasant’s Digital Innovation and Business Transformation Forum. The Forum, a first of its kind in the Caribbean, was part of the Avasant Empowering Beyond series and was held in Port of Spain, Trinidad and attracted over 100 senior executives from leading private and public sector – regional and international organizations. The event was also designed to inspire and stimulate a dialogue on leveraging technology and digital Innovation to drive both economic and social change and witnessed some intriguing ideation on bridging the digital divide in the LAC region. Kevin Parikh, Global CEO, and Senior Partner, Avasant, was the keynote sharing his thoughts on Digital Singularity – the point where technological omnipresence and human experience converge while Anupam Govil, Partner, LAC Head, Avasant presented on the future of outsourcing in the LAC region in the Digital Age, highlighting the impact and increased risks of automation and the need for countries in the region to transition to a ‘Smart Services Destination’. The forum also engaged a panel discussion on Driving the Economic Agenda in the Digital Age: Opportunities and Challenges featuring panelists from the Inter-American Development Bank (IDB), Massy Technologies, invesTT, JMMB and the University of the West Indies. As a key development partner for the region, the IDB highlighted its role in supporting transformation and innovation initiatives across the Caribbean economies. 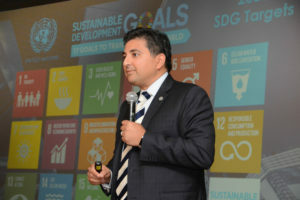 Avasant and IDB have partnered in several LAC countries on a range of programs aimed at improving macro-economic development factors by leveraging technology as a key enabler to drive human and natural resource optimization. This includes developing sector strategy for ICT, Tourism as well as rolling out innovative skill aggregation platforms including Haiti Digital Skills. The partnership leverages Avasant extensive on-ground experience in over 25 LAC countries to provided highly customized solutions. Avasant Foundation’s Executive Director, Chitra Rajeshwari, presented on the need to develop a scalable, digital skills pool and shared its achievements in Jamaica and Haiti. According to Kevin Parikh, “Avasant’s physical presence in Trinidad and Tobago will further enable it to better understand the Latin American and Caribbean landscape, its opportunities and challenges, in turn, helping the firm to provide realistic and achievable solutions to its development partners in the region.” He further added that while Avasant has been in the LAC region for over a decade it is witnessing a significant growth in the region making it imperative to set up a regional presence. The Trinidad operations are expected to significantly scale over the next year to include multi-lingual and multi-disciplinary consulting operations. The Forum also saw the launch of Avasant’s Digital Competitiveness RadarView – a proprietary framework that evaluates countries on their readiness for accelerated digital adoption while providing a blueprint to identify legislative, infrastructural and human resource improvement areas. 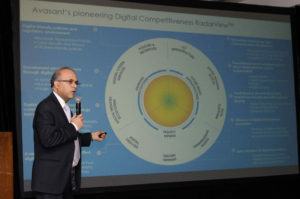 An exclusive preview of the Digital Competitiveness RadarView was presented by Anupam Govil, in which he noted “(Radarview) measures the maturity of countries to tackle digital singularity” rating countries as ‘Emerging’, ‘Challenger’, ‘Innovator’ and ‘Leader’. Avasant provided a snapshot of the Trinidad & Tobago country profile, showcasing T&T as a ‘Challenger’ with strong potential to advance in the digital economy. View this release on PRweb. Avasant is a leading management consulting firm focused on translating the power of technology into realizable business strategies for the world’s largest corporations. Specializing in digital and IT transformation, sourcing advisory, global strategy, and governance services, Avasant prides itself on delivering high-value engagements through industry-focused innovation and flexible client-based solutions. Our seasoned professionals have an average of 20 years of industry-honed expertise, having conducted 1000+ engagements in over 50 countries. Avasant’s next generation consulting and advisory methods have made it the top-ranked firm in its class, with recognition from numerous organizations, including: Vault, NOA, IAOP, and Wall Street Journal. Avasant’s engagement in the global market has inspired a strong commitment to community and purpose. Avasant Foundation supports technology and skill development programs to create employment opportunities for youth across Africa, Asia, the Caribbean and Latin America. For more information, visit https://www.avasant.com. Follow news, photos and video on Twitter at http://www.twitter.com/avasant, Facebook at https://www.facebook.com/avasantllc, and LinkedIn at https://www.linkedin.com/company/avasant.